Venture Mfg. Co. Linear Actuator Has Been Serving Various Industries Including Military, Agriculture, Food, Satellite, Solar Tracking, Medical & Others. 1. Designing different actuators for varied needs. 3. Making linear actuators in tight budget. 4. Serving clients in quick around time for their custom needs. 1. Some of our clients are from highly respected construction and manufacturing firms. 2. We serve clients from military, Renewable Energy, and satellite industries. 3. Students are some of our buyers. We have earned the trust of huge customers from varied industrial sectors; thanks to our ability to manufacture efficient and custom actuators in quick turnaround times as per the specifications of our clients. 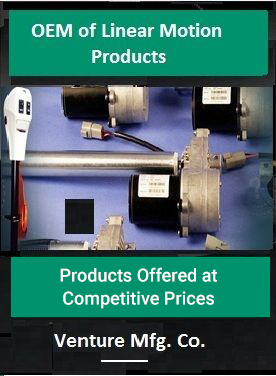 Moreover, affordable cost of our actuators is one of the prime reasons for client inclination. 1. Growing demands for highly customized linear actuators from niche industries makes deliverable delays. 2. Big market players with large investment and capital giving challenges and huge competition around. 3. Ever changing needs and requirements of customers posing challenges to manufactures. 1. From a detailed market research, we come to know that there is huge demand for 12V linear actuators. Hence, we categorized our actuators as 12v, 24v, 36v, 90v and 120v. 2. Also the motor specification are categorized as 110vac, 220vac. 3. We define specific actuators like D.C. Actuators, Stepper Actuators, Satellite Actuators, Military Actuators, Screw Actuators, Acme Actuators, Slide-Out Actuators etc., on the basis of specific applications and industry served. 1. Our executives are always open-up for providing complete solutions for customers via e-mail and phone. 2. We provide our customers with free consultation pertaining to the type of actuators that offer them with optimum results. 3. We are 100% committed to fulfill theexpectations and requirements of customers. 4. Due to our efficient customer communication and quality products we have retained our customers. We have created a niche in the market as a trusted brand for them. It is due to our prominent customer relationship and quality products, we are able to run business successfully since 1971, despite of huge challenges and threatening competition from huge manufacturers.